This is sought of a secondary project I have been tackling along of my main project. The main goal of it is to study dye/nanoparticle systems that could be used develop nanoscale electrooptical molecular sensors. Currently, I am primarily focusing on the fabrication of porous semiconductor films using commercially available nanoparticles and the sol-gel method. The basic operational principle is as follows. 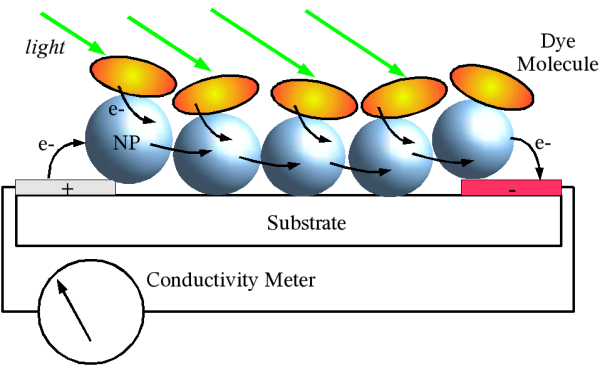 Upon photoexcitation an electron is injected into the conduction band of the nanoparticle. 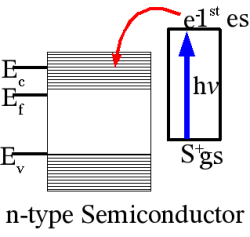 This leads to impurity type photoconductivity in which only one type of free carrier is generated. 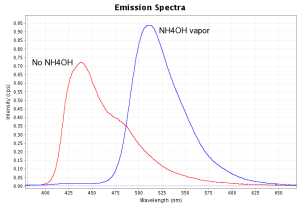 Because the degree of photoconductivity is directly related to photon absorption by the dye, anything that modifies the photophysical characteristics of the dye, should show up as a change in the photoconductivity. 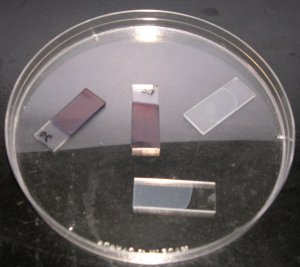 This change in photoconductivity could be used to detect the presence of a particular chemical, provided the chemical modifies the dye's photophysical properties. Here are some of my results so far. This sample consist of commercially available antimony doped tin oxide nanoparticles. 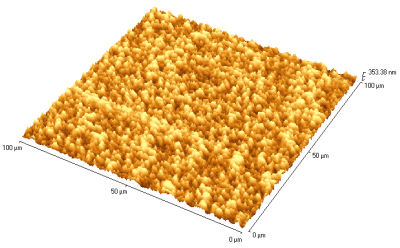 As you can see from the optical and AFM images the quality of the films are pretty good, and more importantly they are very porous. Also, conductivity measurements does confirm that the films are in fact conductive. The colored samples have been coated with a squarylium dye. This project explores the viability of sol-gel derived inorganic/organic composite nanoporous powders, doped with various lumiphores as sensors. 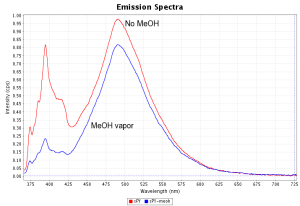 Thus far, a number of lumiphores have been successfully incorporated into these powders and have shown potential for the detection of methanol and ammonia vapors. Challenges still remain though. For one, the ability to undergo several sensing cycles, without degradation, needs to be improved, and the sensitivity still needs to be worked on. Here are some preliminary results so far.